MassDOT has decided to expedite project 606376 to replace the deck of an overpass of the Mass Pike that is located in Allston, along Cambridge Street. The plans are already in 100% design state because they have been sitting around for a few years. However, they are offering a chance to comment over the next ten days, and at Tuesday's public meeting, they pledged to incorporate suggestions if possible. This is probably a once-in-a-generation opportunity to help fix a blight that has plagued Allston since the construction of the Mass Pike extension in the mid-60s. The project scope extends from the intersection with Harvard Avenue in the west, to the intersection with Lincoln Street in the east. It also includes several minor repairs to the pedestrian footbridge across the pike at Franklin Street, but nothing more significant. MassDOT has suddenly gotten interested in this plan after it languished for several years, because the deck is deteriorating to the point where replacement must happen within the next couple of years. Conditions above the deck have been nearly intolerable for the past few years as well. A little history: prior to the construction of the Mass Pike extension in the mid 1960s, Cambridge Street had a smaller overpass of the Boston and Albany railroad. Lincoln Street, Mansfield Street, and Royal Street all connected directly to Cambridge Street. The construction of the highway meant widening the right-of-way. Homes along the south side of Lincoln Street were taken (including Fred Salvucci's grandmother's home), as well as some homes on Mansfield and Royal, and the streets were reconfigured. Lincoln Street was redirected to curve to the northeast, paralleling the new highway. 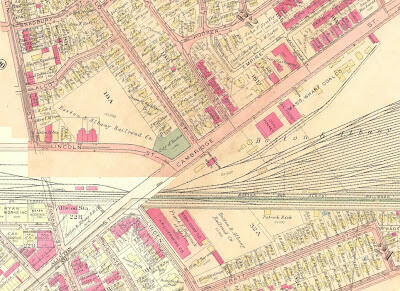 The ends of Mansfield and Royal were chopped off and reconnected to Lincoln Street. Then, Lincoln Street was rerouted over the Empire Street right of way and re-attached to Cambridge Street where Mayflower Street is shown on the map above. The net effect was to sever the street grid and create an overly long, uninterrupted block from Linden Street to the new Lincoln Street intersection. Motorists treat this stretch as if it were part of the highway, racing at high speeds along the excessive capacity, and creating a scary environment for anyone not surrounded by 2 tons of steel. Eagle-eyed readers will notice there is a "tunnel" marking by Franklin Street. This was the location of a 19th century grade-separated walkway under the tracks. This was covered over and replaced in the 1960s by the current Franklin Street pedestrian overpass, which connects a point opposite Highgate Street on the south side, with Franklin Street on the north side. There is also a ramp at Mansfield Street, to replace the street connection that once existed. It climbs the berm so that people walking from Mansfield Street can reach Cambridge Street directly. The Cambridge Street overpass of I-90 was given six lanes of automobile travel, small sidewalks, and no safe means of crossing, over 45 years ago. It has remained so since, but the bridge deck has reached the end of its lifespan and must be replaced. Both MassDOT and BTD have shown a willingness to improve conditions on the bridge for walking and bicycling. They have recognized that six travel lanes is massive overkill: the feeder streets only have one lane in each direction, so there is simply not enough connecting capacity to fill six lanes anyway. As a result, they have drawn up buffered bike lanes and wider sidewalks into the current plans. Unfortunately, in the same plans, they have decided to place a quarter-mile long fence right down the middle of Cambridge Street, from end-to-end of the scope. The claim is that they are concerned about "safety": many people trying to get between North and South Allston are unwilling to walk a half-mile out of their way to use one of the intersections. So, instead of providing safe places to cross the street, the state agency is simply try to block all crossing. But that's unacceptable to the community. We need north-south permeability here. The sheer number of people willing to walk down the center median and climb the current concrete barrier attests to that. Many of these people live in North Allston and need to access jobs, shopping or bus stops in South Allston. Others live in South Allston and want to reach neighborhood resources in North Allston. MassDOT needs to accept that north-south travel is just as valid as east-west travel on this city street. Now, MassDOT wants to stick to their scope and their schedule because they feel hurried to get this done. I also agree that this project needs to get done as soon as possible. So this comment period will likely be the last chance to ask for improvements in the final design. What's exciting about this project is that the city has apparently been making plans quietly for a kind of "corridor to the river" from Allston to the Charles that uses Cambridge Street. For many decades, this street has been a barrier to walking and biking, with dangerous highway ramps and speeding trucks, but it could be transformed into a gateway instead. The River Street Bridge replacement project (shown in blue) will be underway right after the Anderson bridge is complete. So, after that, the missing piece is in the middle: Cambridge Street. Cambridge Street is a city street, and should look and feel like a city street, not a "mini-highway." MassDOT and BTD are both onboard, in principle, with fixing Cambridge Street and building this "corridor to the river" but they seem to be fragmented in planning. Management of the corridor is split between the two agencies. We need them to be on the same page so that the final outcome is coherent. 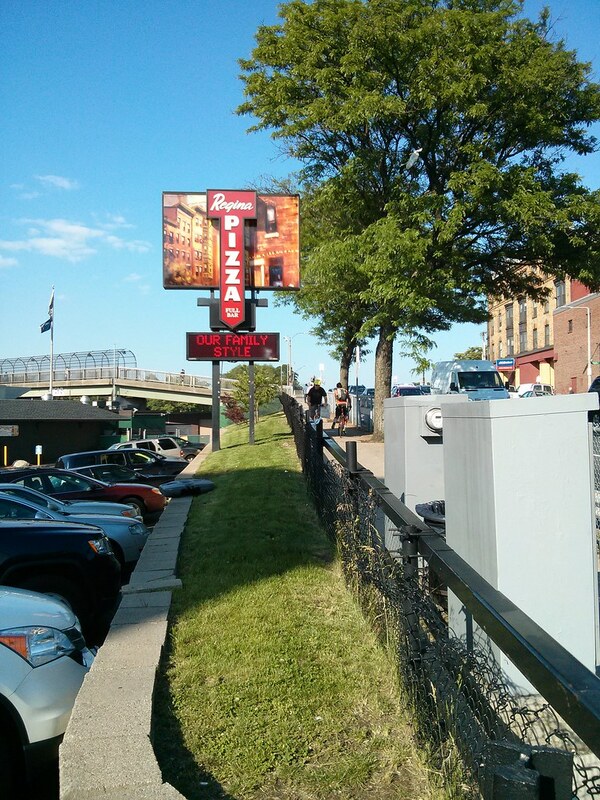 A quarter-mile long fence with no crossings is not acceptable to the Allston community. There needs to be a safe place to cross. 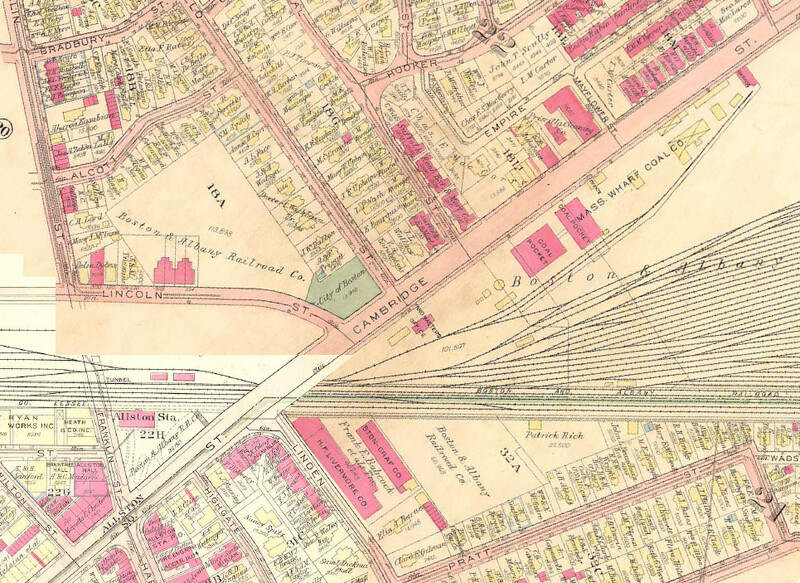 Some possibilities include the Linden Street intersection, or the Mansfield Street stairs. It should be possible to put a coordinated traffic signal at Linden Street which helps crossing with no impact on motor traffic. During construction, a 2 year period, portions of the bridge will be closed. There will be three phases: each third of the bridge will be shutdown and replaced, from north to south. Although I understand that there will be unavoidable impacts, MassDOT needs to ensure that non-motorized access is considered seriously during this time-frame. 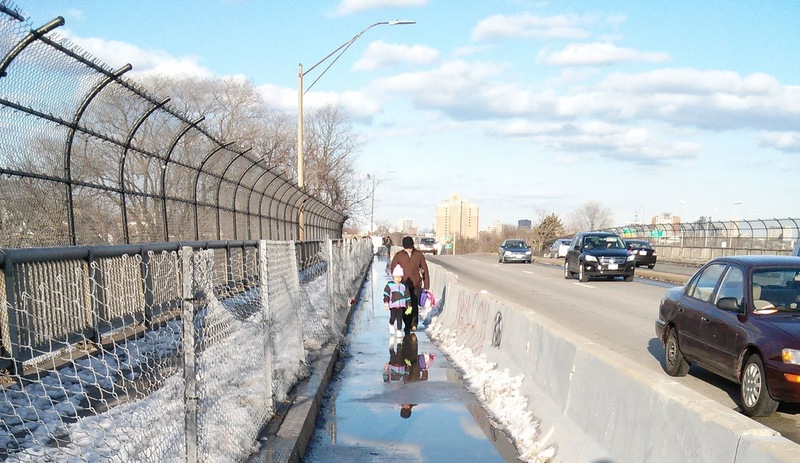 The Franklin Street overpass attracts heavy foot and bicycle traffic, which must share a narrow sidewalk along the north side of Cambridge Street near Harvard Avenue. 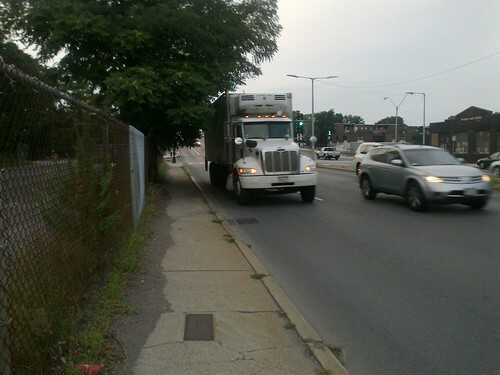 The MassDOT plans call for directing the bicycle lane up a ramp and onto that same sidewalk. It will be widened to 13 feet, but, it turns MassDOT engineers had not anticipated that there currently is (and will be) 2-way bicycle traffic on this segment because of the overpass. 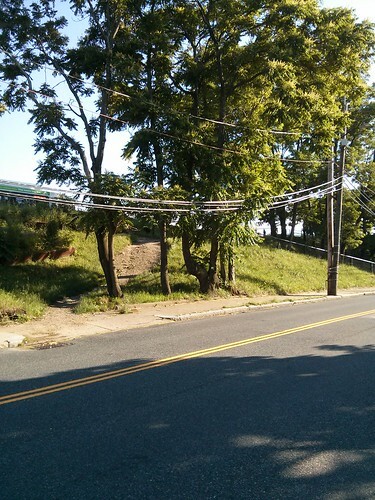 Luckily, there is a grassy strip adjacent to the sidewalk which could be taken for a sidewalk-widening easement. That needs to be considered. Two bicycles take up all the space already; but look at that potential width! You may also read more, including the 100% design plans, on http://cambridgestreetoverpass.blogspot.com/. In addition to what you've said, it should be noted that the buffered bike lanes do not continue all the way to Harvard Ave. So going eastbound, bicyclists have to share a travel lane with cars uphill for the first 1/3 of the bridge. 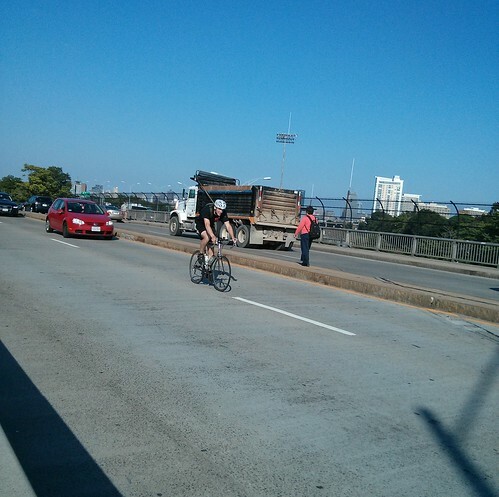 What good is a buffered bike lane if it doesn't start until the top of the bridge? Going westbound, the bike lane feeds into the multi-use path. But nearly all cyclists going westbound are headed straight on Cambridge St or are turning left or right onto Harvard Ave. There is little use to feeding them up onto a path for that short stretch only to have to jump back into the street again. The bike lanes need to continue all the way to Harvard Ave. I am confident it can be done by eliminating the right turn lane going westbound and one of the eastbound travel lanes.